Diamond Platnumz’s sister Queen Darleen was left in stitches after seeing his father, Mzee Juma, featured in a new song. Mzee Juma teamed up with Tanzanian artists, Sungura Madini and Blod gaza for a new song dubbed “Umenikamata” which Darleen believes was just too funny. Queen Darleen says when she saw it, she laughed so hard to a point she got a headache because what she was seeing was just too much to handle. “When I saw it, I laughed for almost two hours. My boyfriend told me to just stop watching,” she said. Support Not too long ago, Abdul Juma made headlines when he revealed he was diagnosed with skin cancer and was not getting the medical assistance he needed from his son. As much as she loved the song, Queen Darleen was not ready to help him out. “No I don’t have plans for my dad,” she said. When Mzee Juma released the song, his son Diamond gave his support on social media by simply saying: Kill them. 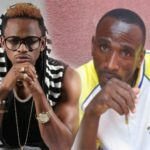 The post Diamond Platnumz sister after seeing her dad’s song: I laughed for almost two hours appeared first on Ghafla! Kenya.